Home – Handwriting University: Learn Handwriting Analysis and Graphology. the button on the upper right hand corner of this site. Join us for the next live classes, which are happening all this month. Visit our Live Seminar Page to find out which level of class you want to attend. Also, if you are a Certified Handwriting Expert, you can now apply to become an Authorized Mentor and start building a business partnering with our school. Open a campus in your city and change lives. We are actively seeking out partner in cities worldwide. Want to become a professional speaker or trainer? If so, you can take business training and live marketing training as part of the 401 and Mentor program. Just call our USA or Indian offices to learn more about turning this valuable skill into a full or part-time career. Join the new community of handwriting experts working to build a business as part of the new Authorized Trainer’s Program. Join Bart Baggett live and teach a local class in your hometown. Learn more about the Authorized Trainer program here. 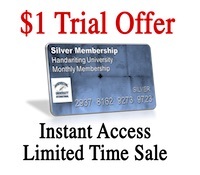 Monday March 25th, 2019 is the next upcoming live tutoring class for Silver members (open to the public if you join the Silver Program) See the Live Class Schedule page to upload your handwriting samples now and write down the call-in #) Or, visit the replay page now and listen to past tutoring calls with students worldwide. Go here to register and send in your handwriting sample. Visit the Member Status page which now shows you the products you have unlocked or have purchased. There are tons of free stuff on this site, but the premium courses are locked and you can visit this page to see which of the products you don’t own… you can unlock with a quick online payment to over 40 hours of premium training, including the Certification Home Study Course or the 501 Mastery Course. Remember, you can get personal private tutoring in person or via Skype through one of our Authorized Mentors and Trainers in countries across the world. Visit HandwritingAnalysis.org to find a mentor or authorized instructor. We now teach classes in Hindi, Chinese, and English. 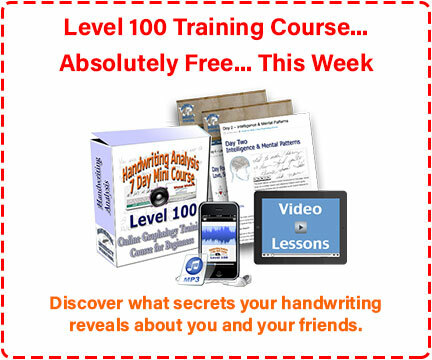 This basic level 100 7 part course walks you through the basic process for analyzing handwriting (graphology) in written, audio, and video formats. Already a student? LOGIN to our teachable interactive courses. Some of our courses are inside this website and some are at the URL above. Two different login locations. Read new and archived articles, newsletters, and special reports made available exclusively to monthly members. Get your personal questions answered by a Handwriting University Faculty Member during these live call-in SILVER MEMBER monthly classes. You can listen in live via telephone or the internet, or watch the video class replay. Catalog of All Programs, books, and videos courses. Upgrade here to any “level” access to programs on this website. 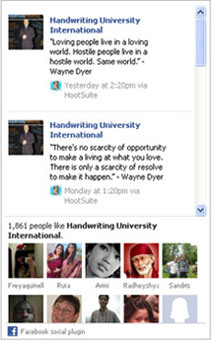 Here you can have instant access to all courses on this website from Handwriting University’s membership site and products written and created by Bart Baggett. Here is a full list of frequently asked questions related to handwriting analysis, graphology, graph-therapy, and signatures. Need Support? We have a Frequently Asked Questions page and if that doesn’t help you out, our support team is ready to answer any of your membership or billing questions.